Last year RadarBox24 came out with a specialty ADS-B RTL-SDR dongle. This is a custom RTL-SDR which contains a built in 1090 MHz tuned amplifier and filter. We have not tested this dongle yet, but we expect that the design and performance would be very similar to the FlightAware ADS-B dongles. A network analyzer report from RB24 is provided here. These dongles can only receive 1090 MHz and do so better than a standard RTL-SDR due to the built in LNA and filter. The LNA reduces the noise figure of the dongle leading to greater sensitivity, and the filter removes any strong out of band signals that could overload and desensitize the dongle. This results in greater reception range, and more flights tracked. Please note that these dongles cannot be used as wideband general purpose RTL-SDRs due to the filtering. 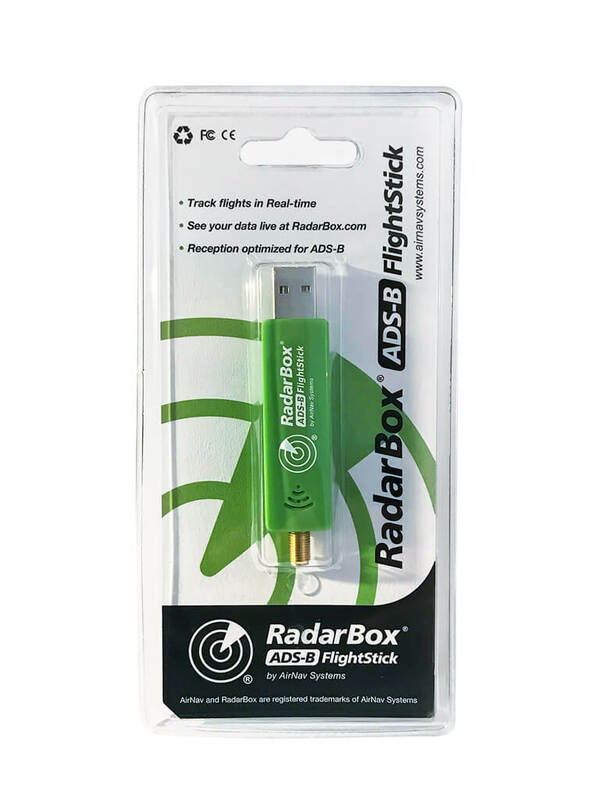 Recently in an attempt to gather more volunteer contributors, RadarBox24 has decided to sell their ADS-B dongles at a loss, pricing them at only US$9.95 + shipping (or on Amazon USA with Prime). Shipping appears to be anywhere from US$5-$8 depending where you are in the world, and shipping does not increase with two or more dongles being ordered. Anyone found a compatible Windows 10 driver? (((John in UK))).im in England also keep us updated let us know when you receive it..so i will place order aswell.amazon (sold out). Ordered from RadaBox website directly, just under $15, total delivery time 3 working days – turned out it was posted from UK as RM48 package. I have to give it to them – wrapping was amazing – massive cardboard (A3 size about inch thick, pre-cut (almost shredded) paper around a wrapping paper covering a heat formed plastic case that’s completely sealed. Plugged in and seems to work well. The antenna connector (SMA) is getting really hot but nothing else so far. I will be doing some performance comparison to my old receiver as soon as antenna adapters arrive so I can test on both on the same antenna, so can’t comment on that yet. Why not use https://www.radarbox24.com/store ? They accept Paypal. I am in the UK and it has already shipped. It was US amazon, but it looks like they’re sold out now. You can get these on Radarbox24’s Amazon store for the same price, with Prime shipping.